The playmaker is keen to make the most of his chance to shine at Easter Road. Ryan Gauld has said that he's relishing the chance to impress big crowds in Scottish football and want his Hibs move to be the springboard to international recognition. The playmaker has moved on loan from Sporting after finding it hard to make the breakthrough with the Portuguese side. 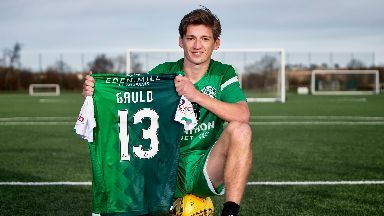 Though he's had a series of loan spells within Portugal, Gauld said he felt it was time to return to Scotland and when Hibs did the groundwork to take him to Edinburgh he was sold on a move to Neil Lennon's side. "Spending the last six months in the second division in Portugal, I thought this was the first time since I went to Portugal that it was the right time to come back to Scotland and get back to enjoying playing in front of big crowds," he said. "That's what Hibs have. "I was aware of their interest for a couple of months before January, and when I saw all the work they put in and interest they showed in me, it made me really keen to come back. "I just want somewhere I am going to feel comfortable and hopefully going to get a lot of game time and the opportunity to show what I can do, because at this moment you can see a lot of good signings have been made in the league. "I think this is the strongest Scottish football has been for some time, the most competitive the league has been. So I think it's a good time to be involved in Scottish football." The 23-year-old, who made his name at Dundee United before his switch to Sporting, has had a taste of the Scotland set-up and is now aiming to catch the eye of Alex McLeish. "That was definitely part of my intentions as well, because I see at the moment the manager is choosing a lot of boys that are playing in the Scottish league," he said. "Hopefully, if I can chip in and help Hibs and hopefully show what I can do, who knows what can happen? "If you ask any player, one of their dreams is playing for their country. I had a wee taste of it just after I moved to Portugal, I was in and around it for a couple of qualifying games, and it's definitely something I would want to be involved in again."